Making granular synthesis easy and fun, Pro is a must-upgrade for Padshop users and a bargain for everyone else. User sample import! Reverb makes it even more atmospheric. Three-band EQ is useful. 150 new samples and 300 new patches. Some of the new patches sound better without the new reverb. 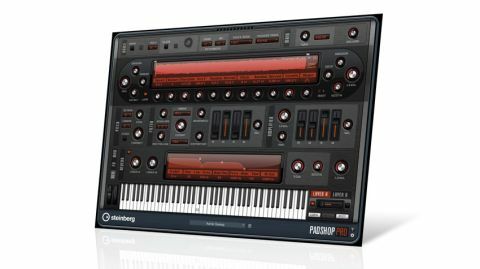 Steinberg's Padshop is an impressive synth. A cross-platform VST3 plug-in, it's an easy answer when you need to pour rich sauce over a bland concoction. The fact that it works its magic using granular synthesis is cool, but that it presents that synthesis in an intuitive manner is deeply impressive - even more so given its very reasonable price. However, it also comes with some obvious omissions, sample import being an all-too-clear example. And of course, it only works in VST3-compatible hosts, which - as far as we're aware - means its currently limited to use with Steinberg's Cubase (which it comes free with), Nuendo and Sequel DAWs. Enter Padshop Pro, then, which not only has even more presets and samples built in, but also empowers you to work entirely from the ground up if you like, using your own WAV and AIF files, subjecting them to Padshop's awesome granular engine. What's more, it comes in AU/VST3 flavours for Mac and VST2/VST3 for PC. "Padshop Pro utterly transforms samples"
We won't go into great detail about the granular engine here, having already covered it in our Cubase 6.5 review. However, if you don't know, the idea is that sounds can be chopped into 'grains', the playback of which can be manipulated in various ways. One of Padshop's big pluses is that it has a sound of its own that seems smoother and less random than most other granular synths we've come across. Padshop Pro utterly transforms samples: vocals are subjected to creepy deconstruction, and even clichés like pan pipes are mutated into ghostly locomotive engines. But it's not all about out-there sound design. The included string patches demonstrate that Padshop Pro can also be used to add subtle movement to otherwise static samples, while a grand piano sound is subjected to an echoing Eno-esque ambience. It's easy to quickly create original timbres by simply importing your own samples into existing patches. For example, the above-mentioned piano patch reinvented a percussion loop of ours as an avalanche of atmospheric textures. "Padshop Pro also introduces a three-band parametric equaliser and an an algorithmic reverb"
Along with the original's chorus and delay effects, Padshop Pro's processing rack includes an algorithmic reverb, with Pre-delay, Size and Width parameters. The effect sounds good and feels like an obvious addition to an instrument designed to create background ambiences. Padshop Pro also introduces a three-band parametric equaliser. A simple affair with adjustable Q only on the middle band, it adds yet more spice to the space. Both EQ and reverb are shown off in 50 new presets. That said, we found ourselves turning the reverb off for some of the presets, preferring them without it. The reverb and EQ aren't really the main draw, though - it's the sample import that really makes Padshop Pro an obvious improvement over the non-Pro edition. Given the price difference (about £25), newcomers would be mad to buy the standard VST3-only Padshop over the improved, multi-format Pro version. Of course, Cubase 6.5 and Cubase Artist 6.5 users already have the standard Padshop bundled with their DAW, and with the upgrade to Pro being a mere £9, it's a real no-brainer.